I started my apprenticeship with a freight forwarding company in Germany for a job title called: Management Assistance. I found it odd to begin with why a freight forwarder would hire a Management Assistance since they're moving freight, right? After a couple of years with the company and paying attention to not only my job but the ones around me it blew my mind away how many different jobs there were to make this one company run well. Little did I know that this company also had its own IT department. Of course, somebody needs to help out when things go wrong with the system and I'm very glad that the IT found me or I found the IT. Most of the time all we see is the execution but not how it came to this execution. How much managing and planning and also manpower has been behind this one execution of the company. Let me give you a little understanding about how our company works in regards of our schedule of services. I think it is very helpful for our customers to know when they call us and have a question about a service date. We plan our routes ahead of time and make sure that one truck has the least amount of miles to drive from one customer to the next once he is in the targeted area. Once assigned, we route them the quickest way possible and schedule them in our IT system (exactly, we also have an IT system). Once we add the customer and schedule the first application the following applications will be scheduled automatically after generating the new cycle each month. When it comes to single applications as well as potential re-sprays it is very helpful to give us a heads up rather than an immediate single application request. Our trucks are on a route in different corners of South East Michigan each day and we try to mix it up very good so we have the flexibility to add a single application anywhere on a short notice. We also have our so called 'emergency truck' that is available around the clock for short notice requests in case the trucks are everywhere but in the area for an urgent single application request. We want to keep our customers happy and satisfied and I hope this was a helpful inside view for you to understand our process of ordering an application and the execution of it. We'd like to shout out a big thank you to everybody who took the time last weekend and stopped by at our booth. Many consumers listened to what we have to offer and asked us great questions. We got lots of new orders in which we loved of course. We also were overwhelmed by the response we've received and are looking forward to attend more shows to make our service known to our neighbors. 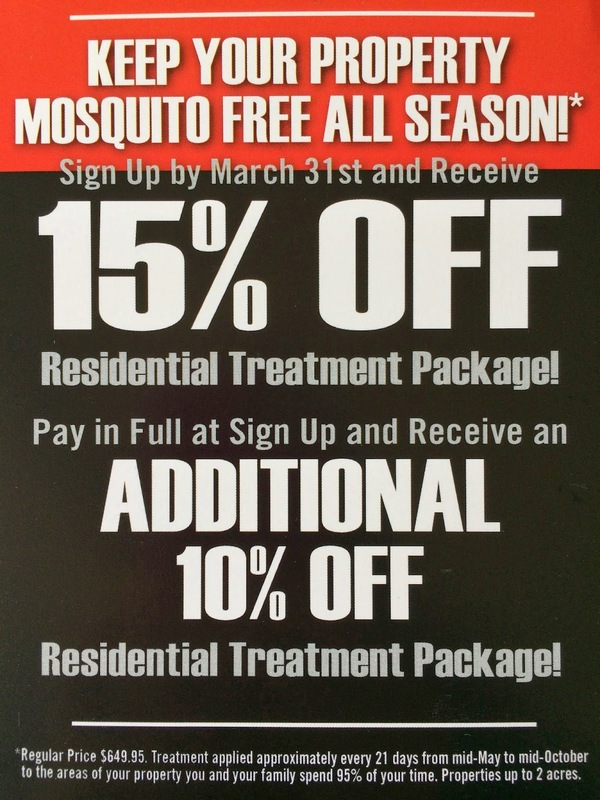 This is a great way for potential customers to ask questions you may have or just make you aware that there is a service out there for Mosquitoes. On top of that we had a great time during the three day show with great booth neighbors around us. It's very funny to see the two totally opposite sides: The consumer on the one side who is going through an information overload stopping by at each booth while the vendor on the other side feel like a broken disk repeating the same thing over and over again but you have to remember the person in front of you have never heard your version before and there are always new questions coming up you haven't heard yet. It is also very interesting to see with each show what works best and how you can improve your presents the next time around. Were you able to enjoy a family dinner, party with friends or just a nice chat with your neighbors outside in your yard without being bothered by Mosquitoes? Get 15% off our Residential Treatment Package by signing up now with an option of 4 easy payments or get an additional 10% off if you pay in full. Let us help you enjoy your Summer of 2014 without these Mosquitoes in your backyard. Since we are living and servicing the South East Area of MICHIGAN it is very important to us to use Michigan Products and Services for our Company 'Mosquito One'. So far we've succeeded with that goal in most areas and we're working with great Michigan based Companies and service our area in FORD Pickup Trucks. Today I just had to stop by at the shop to see the progress and how great it turned out. This beauty is going to have its first photo shoot soon to show off the new design. Wave 'Hello' when you see me driving around in it. The weekend has arrived... we're getting ready to distribute flyers, sending out postcards and starting advertising for the upcoming season of 2014. The weather is cooperating very well with us. Yesterday it started to get warmer and the snow starts melting little by little. People are 'thinking' spring can't be that away... we're almost there and our trucks are ready to get rolling. We're having an amazing team working together at Mosquito One and it is a joy hearing feedback from potential customers how great our advertising turned out. That's what you like to hear. Check out our website at www.mosquitoone.com for our first amazing deal of the season, it's not getting any better than this so make sure if you're considering a season spray with us that you order it very soon. You won't regret it and you'll be able to enjoy a great summer without nasty mosquito bites who can resist that offer? Who knew that Mosquitoes like stinky feet? This made me giggle, who would've thought... Smelly feet are attractive to some Mosquitoes. Movement increased mosquito biting up to 50% in some research tests.